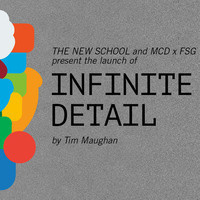 Tim Maughan returns to New York City to launch his debut novel Infinite Detail in a live discussion moderated by McKenzie Wark. Infinite Detail presents a prophetic portrait of the collapse of the networked world and the ways in which a spectrum of people — from hackers to gangsters to virtual psychics — deal with the fallout. Described by Warren Ellis as “the new required reading for the future's next fifteen minutes", Infinite Detail urges readers to reconsider the consequences of digital entwinement, the methods of protest against it, and the ways in which human society can be played and preyed upon by the environment it exists in. Hosted in collaboration by The New School’s Liberal Studies and Culture and Media Studies departments, and MSD x FSG, the evening will also include a discussion on the future of smart cities, whether we can ever return to the pre-digital age, and the ways in which science-fiction can act as a critical means of navigating the future. This event is free with ticket registration.